Next year, both Samsung and Huawei are set to unveil their first foldable smartphones to the public, while the likes of LG and Motorola are also looking into their own solutions. According to various patents, though, it now appears Oppo, which recently made its comeback in the flagship segment, is also looking to take a slice of the foldable smartphone pie. In total, the Chinese company has received patents related to three possible foldable designs, two of which are rather unique. Starting off with the more basic design of the three, the patent depicts a device that can be unfolded horizontally, allowing users to essentially double the display size whenever required. This would be achieved thanks to a special rotating hinge mechanism that’s coupled with a flexible display and would allow the device to be held in place when folded or not. Also, while on the topic of displays that can be extended horizontally, Oppo has also been granted a patent related to a device that contains three displays. Instead of utilizing a mechanism like the one detailed above, this product makes use of three panels that are simply stacked on top of each other and, whenever necessary, the user can pull out from the side to reveal a rather long panel that essentially triples the size of the original one. Moving away from horizontal setups, Oppo’s final patent depicts a vertical fold, much like the designs expected from LG and Samsung. Unlike their designs, though, Oppo’s idea makes use of special airbags hidden on either side of the hinge mechanism in order to avoid any long-term damage to the display. After all, by folding a display various times, the panel could potentially lose its shape. 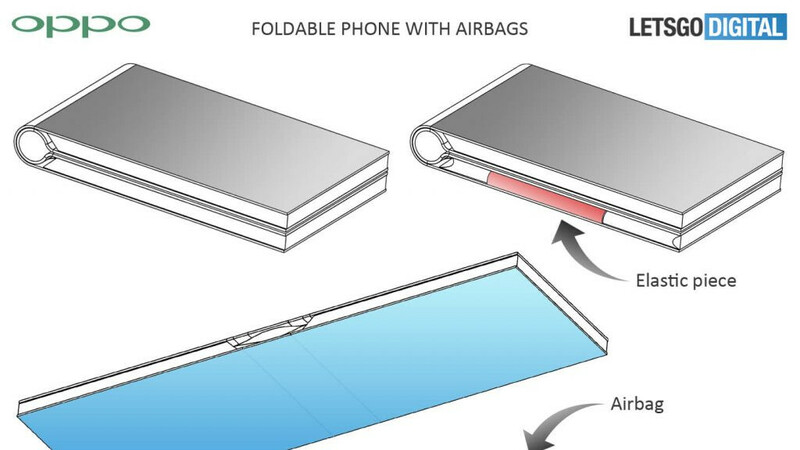 Because of this, Oppo envisions two airbags that would act as a support structure for the screen whenever the device is folded open or shut. Presently, Oppo is yet to reveal any plans for a foldable smartphone. However, it is worth pointing out that the brand is owned by the same company as OnePlus, suggesting the latter could eventually make use of Oppo’s design patents going forward – the brand has previously utilized Oppo’s designs for its flagship models. I'm still curious what the screen will be made of to prevent premature wear when folding.